Rose, a breezy young London shop assistant., has a fleeting encounter with an eccentric who travels around in an antique blue police box, so she takes to the internet to try to find out who he is. It's a net-head nerd who puts her on the trail. This detail - in the revival of Doctor Who - feels exactly right. Because, since the Timelord stopped travelling through space on television 15 years ago, he has lived on in cyberspace, with a life-support system of sci-fi websites. Scenes from the new series have already been leaked to the web in advance of transmission and chatrooms will be cluttered for months to come with fans discussing whether they've used the right shade of silver for the Daleks and whether the threat of a permanent intergalactic winter wasn't done better in The Ice-Cubes Cometh, an episode from 1971. Yet, paradoxically, the show should hope that the chatroom reaction is at least partly hostile. The rule in adapting much-loved properties - whether an old TV show or a Jane Austen novel - is that you're in trouble if aficionados of the original story absolutely hate it but equally doomed if they completely love it. Like a political party,. a television series needs to reach beyond the obvious fan-base. Russell T Davies was an inspired choice as the writer to renew Dr Who. Born in the 60s, he belongs to the generation of viewers who created the legend of a show that made young viewers so nervous they hid behind the furniture. And Davies's current BBC3 project Casanova (a character tackled by Dennis Potter in the 70s) shows his ability to freshen familiar television subjects. The first story suggests that Davies has found the right balance between respect and renovation. The internet and the London Eye play significant roles but the Tardis retains its 50s exterior and an interior representing a 60s idea of the future. And - despite the possibilities of computer generation available to this revival - the opening episode rather encouragingly uses monsters who look as if they could have been knocked up by BBC props 40 years ago: the Autons are shop-window dummies who are brought to life by a "nesting consciousness" which is a big vat of pulsing plastic. Christopher Eccleston is an actor who combines ordinary blokiness with a far from standard inner glow of energy: a combination that Davies has successfully exploited before by casting Eccleston as a latter-day Lancastrian messiah in The Second Coming. The actor's only weakness is a tendency to take his characters and himself too seriously but his Who has an enjoyable sense of mischief which sometimes reveals danger underneath. Even on the evidence of one episode, Eccleston already ranks high in the hierarchy of those who have played the part. With Sir Ian McKellen about to appear in Coronation Street, it's clear that popular culture is benefiting from the willingness of high-profile actors to take roles that would once have been regarded as beneath them. Billie Piper's acting career began with very low expectations, the prejudice of reviewers encouraged by her status as a singer and Mrs Chris Evans. But, in the Chaucerian update The Miller's Tale, she had a freshness and energy on screen that recalled the early Marilyn Monroe and, appearing here as the Timelord's sidekick, there's the same sense that the camera is having to be restrained from getting close to her. The dialogue was rarely vital to the old Doctor Who: the single word to resonate in it was "exterminate!". But there are signs in part one that this series may provide us with some memorable lines as well as being watchable. Rose asks the Time-traveller, "If you're an alien, how come you sound like you're from the north? ", to which the doctor replies, "Lots of planets have a north." After Rose's first shock from the Autons, her mother laments to a friend: "Skin like an old Bible. To look at her, people would think I was her daughter." Neither writer nor actors ever seem to be treating Doctor Who as a holiday from their usual standards. The trap in pop-culture revivals is to satisfy middle-aged nostalgia rather than attracting the next generation. My unscientific screening for a panel of underage critics proved successful: a gasp at the Tardis's trick-the-eye dimensions, a retreat behind the chair when the Autons began their shopping-mall Armageddon. The risk was always that this: "Who" would lead to the question: "Why?" but there's a strong chance that another generation of children will, each Saturday, be asking: "When?" APA 6th ed. : Lawson, Mark (2005-03-21). Carry on Doctor (The Guardian). The Guardian p. 17. MLA 7th ed. : Lawson, Mark. "Carry on Doctor (The Guardian)." The Guardian [add city] 2005-03-21, 17. Print. Turabian: Lawson, Mark. "Carry on Doctor (The Guardian)." 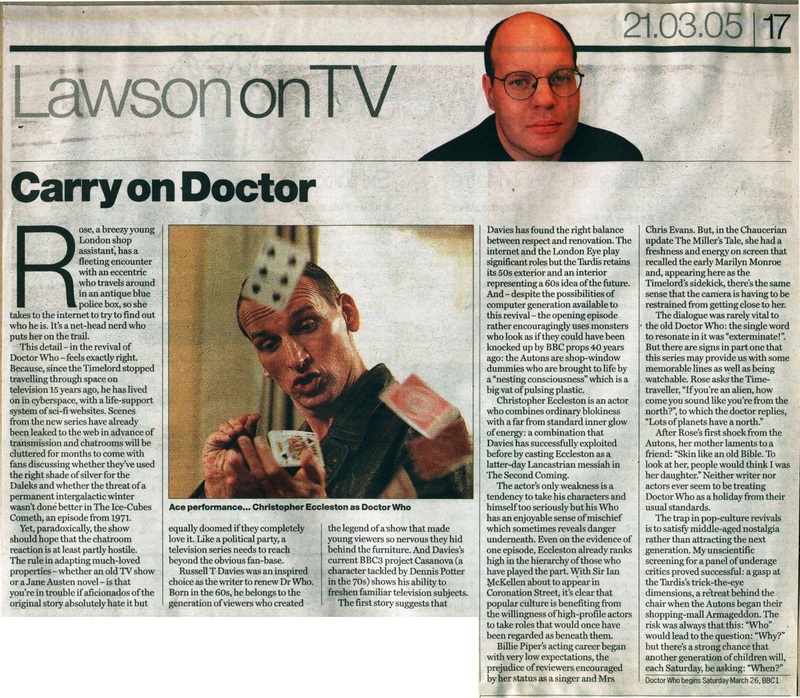 The Guardian, 2005-03-21, section, 17 edition. This page was last modified on 31 December 2015, at 23:45.